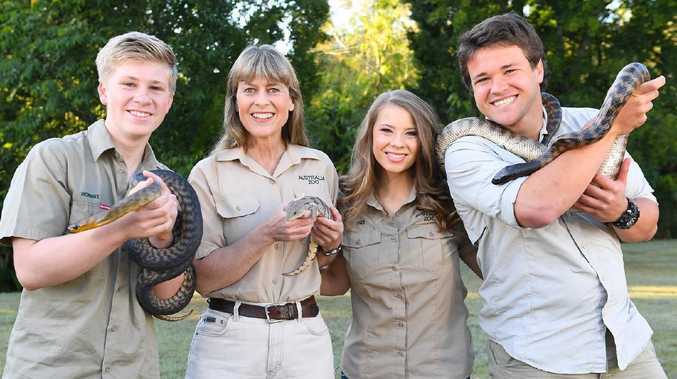 Robert Irwin, Terri Irwin, Bindi Irwin and Chandler Powell will star in Crikey! It’s The Irwins on Animal Planet. THE Irwin family has revealed the name of their new reality series set to air on Animal Planet next month. Crikey! It's the Irwins will follow Terri, Bindi and Robert Irwin, as well as Bindi's boyfriend Chandler Powell, as they live and work at Australia Zoo on the Sunshine Coast, where they care for more than 1200 animals. The series, teased by Animal Planet since early this year, will premiere on October 28. Bindi shared a new clip for the show to her Instagram today revealing the show's name. "It's an amazing place to live. Our alarm clock in the morning is the tigers roaring," Robert says in the video. "You are right in with them." Since Steve's death over a decade ago, Bindi and Robert have appeared on a number of TV shows including Discovery Kids' Bindi, the Jungle Girl and Bindi Wildlife Adventures and Robert's Wild But True. Bindi also appeared on Dancing With The Stars in the US while Robert is a regular guest on Jimmy Fallon's late-night show. "We're all about carrying on in our dad's footsteps," Bindi says in the clip. Terri adds: "We work together, we live together. I love our animals and I love living here. We're excited to share our work at Australia Zoo and our conservation adventures with the Animal Planet audiences all around the world."